The octave of Christmas puts us into the face-to-face relationship of Jesus and Mary. The iconographic tradition likes to depict them cheek to cheek. Jesus comes near us, and he who is full of light fills us too with his light. But this is not sentimental. This is contemplative. Both the Jews and the Catholic tradition see Moses as a high mystic. “The LORD spoke to Moses face to face, as a man speaks to his friend” (Ex. 33:11). “When Moses came down from mount Sinai with the two tables of testimony in his hand . . . Moses knew not that the skin of his face shone while he talked with him. And when Aaron and all the children of Israel saw Moses, behold, the skin of his face shone; and they were afraid to come near him” (Ex. 34:29-30). The blessing “The LORD let his face shine upon you,” is not a sentimentalism. It means that what we most truly long for is not just bread and quails, but the vision of God himself. A vision so profound that it penetrates us, and transforms us, as Moses’s face shone with the light of the face of God. St. Paul speaks about Moses, and says the same is our destiny as Christians: “But we all, with unveiled face beholding as in a glass the glory of the Lord, are changed into the same image, from glory to glory, even as by the Spirit of the LORD” (2 Cor. 3:18). Just as Moses looked at the face of God and his own face was filled with God’s light, so even more with Jesus. 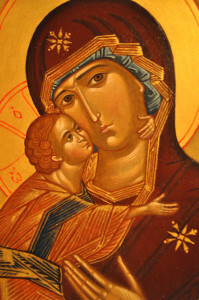 Mary holds the face of God at her breast; she contemplates that face with unspeakable immediacy. Even the shepherds, just passing by, are raised to glory. 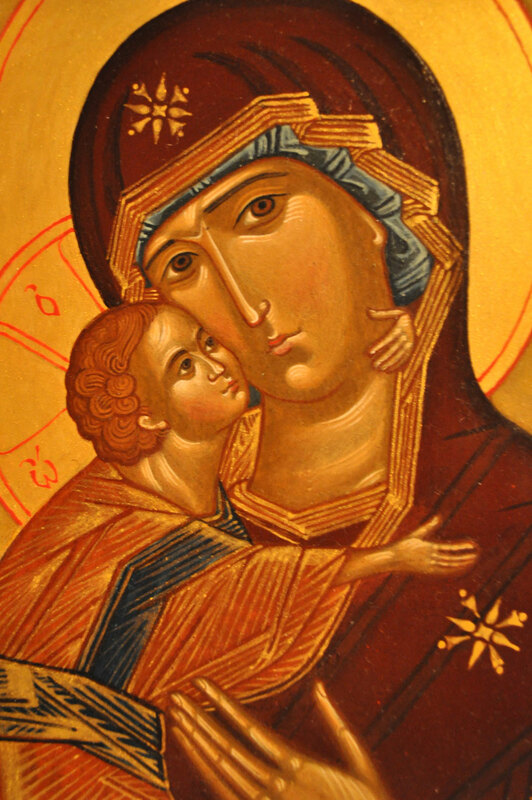 How much more the Mother of God herself, she who presses his cheek to hers? This is the Incarnation. God’s face is made visible. The God of gods is with us, in the arms of Mary. That changes us. The light of his face radiates into our own faces. “When you said, Seek ye my face; my heart said unto thee, Thy face, LORD, will I seek. Hide not thy face far from me” (Ps. 27:8-9). “Turn us again, O God, and cause thy face to shine; and we shall be saved” (Ps. 80:3, 7, 19). “Why are you cast down, O my soul? And why are you disquieted within me? Hope in God: for I shall yet praise him, who is the health of my face, and my God” (Ps. 43:5). Now, it is often said that “Abba,” is a term of endearment, and so the point would be that we call him not “Father,” but “Daddy.” My Scripture-scholar friends tell me this is groundless. Abba is the Aramaic word for Father, plain and simple. “Daddy” is not the point. Speaking Mary’s language is the point. “Abba” only appears three times in the New Testament – all in places that are emphasizing the closeness of God to the Hebrews. The point is, Mary, the Hebrew, receives Jesus into her Hebrew world. He is not the God of the faraway or the abstract. He is the God of where we are. The where-we-are of the Hebrews, of Mary, becomes the where-we-are of all the rest of us, too. Not far away: here, cheek to cheek, his face shining onto our faces. Truly God is with us. God sends the Spirit into our hearts: where we are. What does it mean to call Jesus the “salvation of our face”? How does the light of his face shine on ours?